If you think that the Millennial generation is changing the way we do things, then just imagine the impact that the generation following them might have. While Millennials might have grown up in a world of rapidly evolving technology, the Gen Z that is following them, have learned to use a tablet and smartphone almost before they learned to walk and talk. But how is that shaping the way they think, act, and communicate? Those are the questions that a recent report set out to answer. The Teen, Social Media & Technology Overview 2015 from the Pew Research Center, questioned more than a thousand U.S. teens (aged 13 to 17) to find out more about their use of and attitudes to technology. The results suggest that the blossoming Gen Z is, perhaps unsurprisingly already more digitally savvy and socially connected than even their digitally enhanced predecessors. As the parent of nine-year-old twins, I’m living this on a daily basis, so I have a first-hand glimpse into how this is unfolding. The continuing digital revolution is of course being driven by the seemingly inexhaustible demand for and widespread availability of the smartphone. Almost nine out of every ten teens (88 percent) in the U.S. own, or have access to a mobile device of some kind; for almost three-quarters (73 percent) of them that is in the form of a smartphone with Internet access; and boy are they using them for just that purpose. Like many of their peers, my nine-year-olds have smartphones that are wifi enabled but which aren’t activated as phones. They text, game, listen to music, watch movies, and a whole lot of YouTube videos. Fully 92 percent of teens that took part in the survey said that they access the Web at least occasionally, with the vast majority doing so using a mobile device. Like me, for those of you who have teens or tweens in the family, this next stat won’t come as any surprise, in fact you might think it’s a little understated. The rest of you might be surprised to learn that almost a quarter (24 percent) said that they are online “almost constantly.” More than half went online “several times a day” and just 2 percent less than once a week on average as this graphic from Pew Research illustrates. So teens with smartphones are spending time online, but what are they doing when they’re there? Teens are no different to the rest of us in that they love to connect on the social networks, with a majority (71 percent) reporting that they use more than one social network on a regular basis. Facebook is far and away the most popular social platform with teens, 71 percent saying they use it and 41 percent that it’s the network they visit most often. Instagram is the next most popular, used by just over half of teens and used most often by one in five of respondents. Snapchat comes in third in popularity, being used by 41 percent of teens, with 11 percent saying it was their most favored platform. Although a third of respondents said that they do use Twitter and Google+, just 6 and 5 percent respectively say that they are the networks that they use most often. Older teens tend to use Twitter more than their younger counterparts. Texting might seem like an almost old fashioned concept it’s been around for so long, but it has undergone something of a smartphone revolution. Smartphone messaging apps have changed the landscape for texters, opening up and even eliminating cost structures while at the same time adding new features. 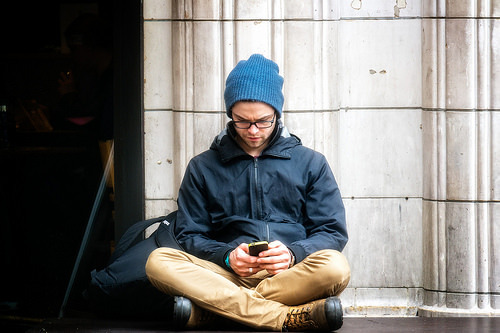 As a result, text messaging is more popular than ever amongst teens, with nine out of ten saying they use text, either directly through their phone or through an app or website. A typical teen sends and receives 30 texts a day. Girls tend to text more than boys and the older a girl gets the more they say they text with the oldest (15 to 17) exchanging texts up to 50 times a day. Texting activity appears to vary according to factors such as ethnicity, household income, parent’s educational attainment, and environment. Almost half of all teens surveyed (47 percent) said that they talk with friends over video enabled connections like Skype, Oovoo, and FaceTime, with older girls again embracing video chat the most enthusiastically. There can be little doubt that Facebook, already the most used social platform for teens, is becoming a major influence as they continue a drive to attract and retain a younger audience. Just consider how they are positioning themselves in the social and messaging market. Facebook owns WhatsApp estimated to have 800 million active users in June 2015. Facebook owns Instagram, the second most popular social network with teens according to the Pew report. Downloads of Facebook’s Messenger app, recently opened up to non-Facebook account holders, has exceeded even those of the main Facebook app according to a report at Digital Trends. Facebook Messenger has been introducing new features that are likely to increase the attraction to the teen market, something that I highlighted earlier this year. Messenger users can now not only send text messages and exchange photos, GIFs, and links; they can send money or receive money via the app, and most importantly, they can also use the platform for free phone and video calling. No phone or data charges, no call logs, what’s not to like about that for a teen—and what’s not to worry about that if you are a parent! The Pew report confirms what we really already knew from the anecdotal evidence around us. Teens (and tweens) are heavy users of smartphones. They go online on and off all day, every day, connecting with one another through the social networks, communicating by text, voice and face-to-face via video. And if you’re a marketer, this is likely of interest to you, as you’re looking at a target audience that’s right around the corner. The oldest of the Millennial generation are now having their first children, and Gen Y (and tweens, like my kids) are even more comfortable with technology than Millennials, if that’s even possible. They are as accustomed to going to the Internet to look something up as they are going to the fridge for a snack. And the same is true when they are looking for something they want to buy (or they want their parents to buy for them). If you think omni-channel marketing, with a heavy emphasis on mobile is important today, just you wait. If you’re a marketer like me who is always thinking about the future, I imagine you might want to download the whole report. You can find it at the Pew Research Center. This article was originally seen on The Marketing Scope.